The Evergreen™ 626 Lumbar Lite delivers effective trunk stability and targeted compression to fatigued muscles that spasm and cause pain. This exceptionally low-profile brace can be comfortably worn under clothing and is easy to don and doff. 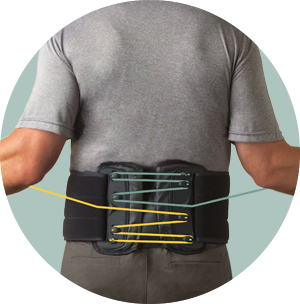 As an adjunctive treatment to current therapy, the economical Evergreen 626 Lumbar Lite supports spasming muscles so patients can get back to the activities of daily living. It is designed to comfortably fit waist sizes ranging from 28-54 inches and up to 64 inches with the extension panel, resulting in a significant savings in inventory costs and space. At less than a pound, the Evergreen Lumbar Lite is our lightest weight lumbar support. Two easy-to-locate pull tabs provide independent compression without the spinal rotation that can occur with a single pull tab system. 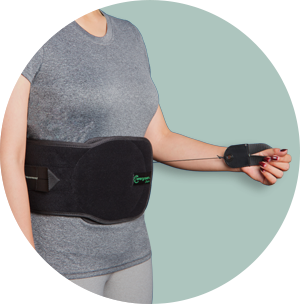 Will my health insurance pay for the Evergreen™ brace? How do I clean Evergreen™ braces? Where can I send my prescription? Contact Aspen Customer Service @ 800-295-2776 to find a local provider near you. The Evergreen™ 626 Lumbar Lite comes in a new one size adjustable and six sizes. Please refer to the patient’s waist circumference and check the sizing chart. Who is my Sales Representative for Aspen Sierra braces?